Odyssey Theatre Ensemble and The New American Theatre celebrate El Niño with a perfect storm of comedy, romance, mystery and magic. 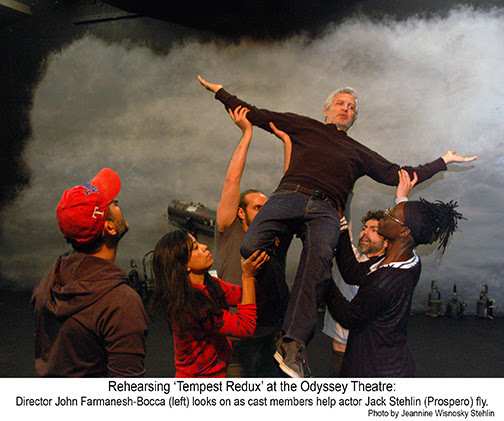 Adapted, directed and choreographed by John Farmanesh-Bocca and starring New American Theatre artistic director Jack Stehlin (Weeds) as Prospero, Tempest Redux opens at West L.A.’s Odyssey Theatre on February 20. Derived from Shakespeare's fantasy, this freshly conceived reconstruction of The Tempest is a potent confection of physical theater and verbal gymnastics — a father-daughter story for the ages that explores the power of love and forgiveness. The cast has been stripped to seven actors and three dancers who not only play multiple roles, but also share some of the same parts. For more information, check out www.OdysseyTheatre.com.